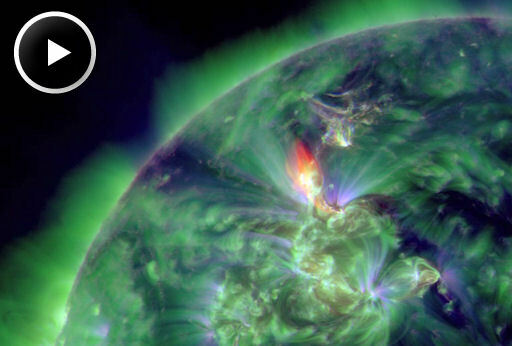 NASA's twin STEREO spacecraft recorded an impressive CME emerging from the blast site: movie #1, movie #2. Analysts at the Goddard Space Weather Lab confirm that the CME is heading for Earth, and they say strong geomagnetic storms are possible (although not guaranteed) when the cloud arrives this weekend. Their animated forecast track predicts an impact on Jan. 21st at 22:30 UT (+/- 7 hrs). Aurora alerts: text, voice. INCREASING SOLAR ACTIVITY CLEANS UP SAT-DEBRIS: Earth's atmosphere has been puffing up in response to increasing levels of UV radiation from sunspots. This is good news for satellite operators, because a puffed up atmosphere helps clean up low-Earth orbit. "The number of cataloged debris in Earth orbit actually decreased during 2011," reports Nick Johnson in NASA's Orbital Debris Quarterly newsletter. 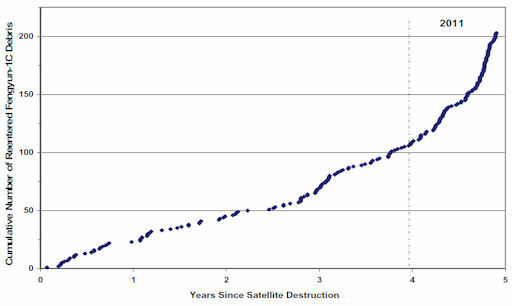 "[The figure below] illustrates how the rate of debris reentries from the Fengyun-1C anti-satellite test of January 2007 increased during the past year." "Even though only 6% of the total 3218 cataloged debris from the ill-advised engagement had reentered by the end of 2011, half of these debris fell out of orbit in the past 12 months," he points out. "Likewise, many debris from the 2009 accidental collision of Cosmos 2251 and Iridium 33 are accelerating their departure from Earth orbit. In the absence of a new major satellite breakup, the overall orbital debris population should continue to decrease during 2012 and 2013." 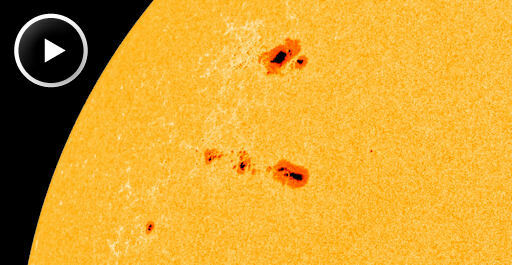 The large one in the middle, AR1401, has a "beta-gamma" magnetic field that harbors energy for M-class solar flares. At the moment it is unleashing one such flare every day, such as this flash recorded during the late hours of Jan. 19th. Eruptions from AR1401 will become increasingly geoeffective in the days ahead as the sun's rotation aligns the active region with our planet. On January 19, 2012 there were 1272 potentially hazardous asteroids.